I absolutely dragged my feet on writing this review. HoZac sent this album to me quite a while ago. They didn't send it to me in 2014, but I've probably had this close to a year. Apologies for the delay, although I am still curious why they chose to send me this one random record from their back catalog. Anyway, I did go into Button By Button with some trepidation based on the artwork. I mean, look at those haircuts. Luckily the album isn't as bad as the hairstyles would indicate, but it also isn't particularly great either. 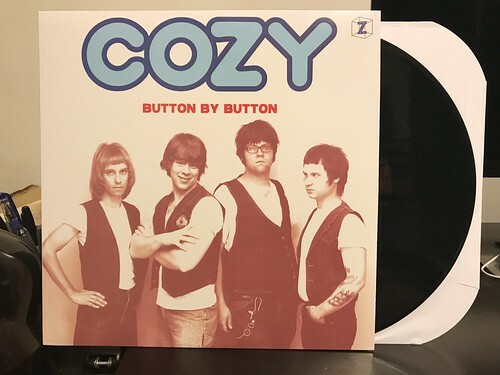 Cozy has churned out the very definition of a middle of the road power pop album. It has the sneering vocals and tight chord progressions you'd expect. It even has some solid hooks and choruses. Where the album is lacking is in originality and energy. I never feel like the band is really firing on all cylinders. They can't capture the magic that a band like Barreracudas is able to. On the other side of the spectrum, they never hit the polish or smoothness of a band like The Knack. Cozy is treading a middle ground and their album is totally fine, it just never really exceeds that mark. Ultimately it's decent enough background music, but not really something I'd go out of my way to listen to.